United Airlines flight 232 was a scheduled flight from Stapleton International Airport, in Denver, Colorado, to O'Hare International Airport in Chicago, Illinois. On 19 July 1989, the Douglas DC-10 (Registration N1819U) suffered an uncontained failure of its number 2 engine which destroyed all three of the aircraft's hydraulic systems. With no controls working except the thrust levers for the two remaining engines, the aircraft broke up during an emergency landing on the runway at Sioux City, Iowa, killing 110 of its 285 passengers and one of the 11 crew members. 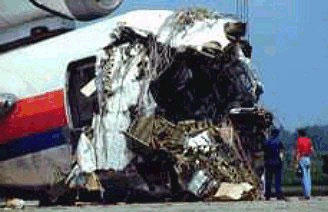 Owing to the skill of the crew and a DC-10 instructor pilot, 175 passengers and 10 crew members survived the crash. The disaster is famous within the aviation community as a textbook example of successful Crew Resource Management, due to the effective use of all the resources available aboard the plane for help during the emergency. United flight 232 was enroute from Denver to Chicago on the afternoon of July 19, 1989. On the flight deck that day were Captain Al Haynes, a 30,000 hour pilot, First Officer William Records, and Flight Engineer Dudley Dvorak. Along with eight flight attendents, there were 285 passengers on board the DC-10. Shortly after crossing into Iowa, the aircraft began a gentle right turn to take it direct to Chicago. With Records flying, there was a loud bang from the rear of the aircraft, causing the entire aircraft to shudder. Haynes saw that the number two (center) engine had failed and asked for the engine shutdown checklist to be started. As Dvorak began the checklist, he noticed that all three hydrualic systems were losing pressure and quantity.